This series is all about experimenting with unusual brewing ingredients. 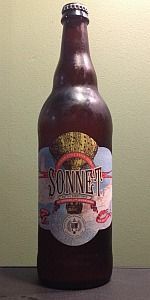 Sonnet uses lemongrass and at 8.5% alc/vol, we call it a Super Saison. With the addition of lemongrass, one expects a spicy, peppery and lemon aroma, with citrus and subtle hop character. Looking at the beer through a stemmed glass, you’ll notice pale straw-gold color and a thick and rocky white head with persistent lacing. Of course, because the 750ml bottle is conditioned, some haziness is to be expected. When pouring the bottle, be aware that some sediment may be present. Pour carefully to avoid this, or don’t. The choice is yours. Appearance: pours a hazy golden yellow color with a 1" head that falls to a spotty covering. Smell: yeast, pepper, grass, and some citrus comes through to the nose. Taste: grainy malt base with yeast, pepper, lemon zest, orange, crackers, and some grassy tones are wrapped in a moderate bitterness. Mouthfeel: medium bodied beer. Crisp to start, less crisp at the finish, long lasting aftertaste. Overall: a nicely refreshing saison that hits the spot on a hot day. Flavor very weak of grass and hay, ends with alcohol burn but no alcohol taste; no hops, no malt, no diacetyl. Palate light to medium, watery, lively carbonation. Another mediocre offering from Southern Tier. The appearance is good, but the aroma is weak and weedy. The palate is good but cannot disguise the poor flavor. A waste of good lemongrass. Pretty good light and slightly sweet with some tiny hint of banana. Bright golden color with a hazy opaque appearance; creamy white head that dies down fast. A slight layer of foam remained on the surface of the beer the entire time I was drinking it. Smell was outstanding - grassy, slightly spicy (notes of freshly ground black pepper) with the aroma of citrus. The taste matched the aroma completely - again grassy, citrus, with slight spicy taste of fresh ground black pepper that lingers on your tongue. Medium body with a spicy feel in your mouth ending in a dry finish that I did not care for. (I felt thirsty like I needed water after drinking this beer.) I thought that this beer was interesting, though it is something would probably purchase again. The beer was not thirst quenching at all; it left me feeling dehydrated after drinking it.